Hi everyone Ruth here. Tonight I'd like to share with you this evening a post about using hessian (burlap) and a few of my favourite substrates and techniques. 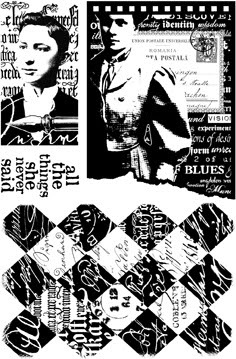 When I saw there was a fabric topic, I just jumped at the chance, my blog blurb says I love using ink, paint, paper and fabric so this incorporates all of these and more. I found inspiration in a few different places. Firstly I'd seen a canvas covered in hessian and simply painted white with some images printed on tissue and applied, so this was the starting point. 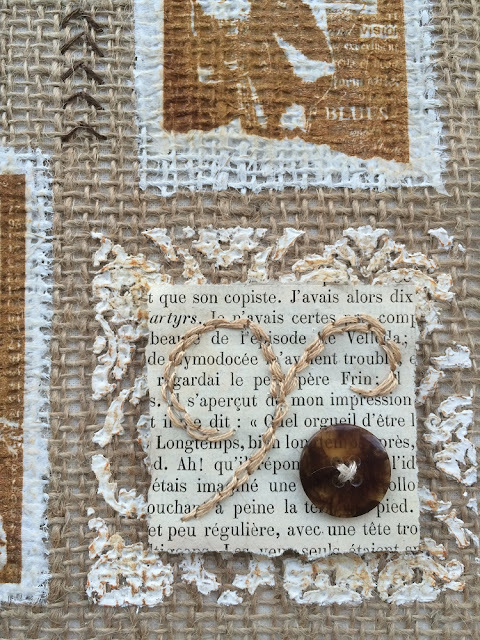 Add in a recent Lin Brown workshop which has reawakened my love of hand stitching and then a photograph of an embroidered book page I'd seen and I was all set to create a sampler with a rustic feel. I'm using some of my favourite Ink & the Dog images, they have a beautiful vintage feel and although I hadn't intended it to have a sewing theme, I've was drawn down that path. I even sneaked in some ribbon, tape and buttons! Step One: Firstly I cut the hessian to size, allowing a small border and fraying the edges. I then made some tabs that would attach to the back of the finished sampler. 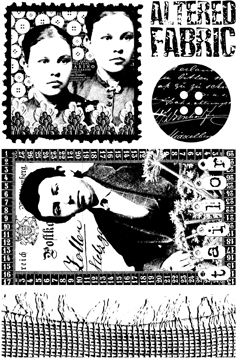 Next I stamped several images roughly on tissue from At Home Plate 3, Buttons Plate 6 and Letters Plate 5 and played around with the placing of them until I was happy. I decided to use just 3 main images. I didn't attach the backing or tabs until I'd finished the hand stitching. Step Two: Next I masked off an area around each image leaving a small border. I painted the areas with Chalk fresco acrylic paint. 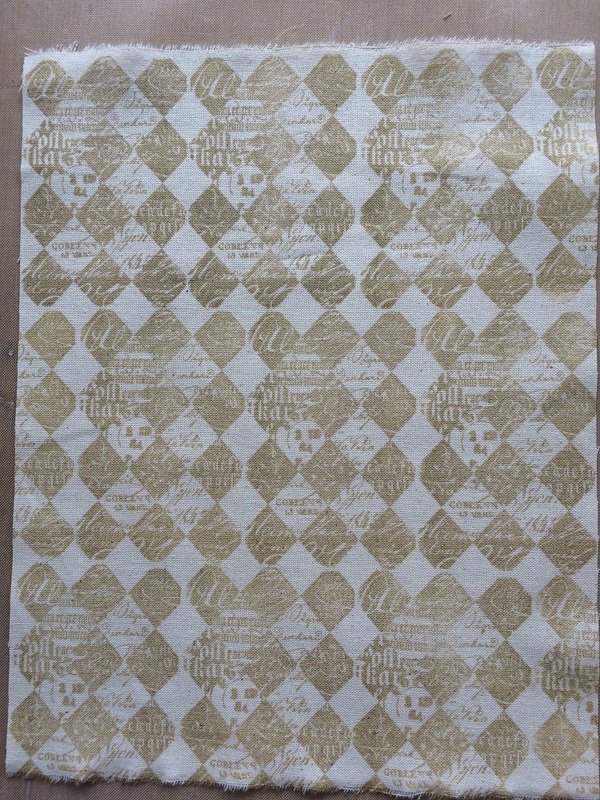 Step Three: I masked another area off and spread grunge paste through a gothic stencil. I dry brushed the paste once dry with Caramel and French Roast fresco acrylic paint. 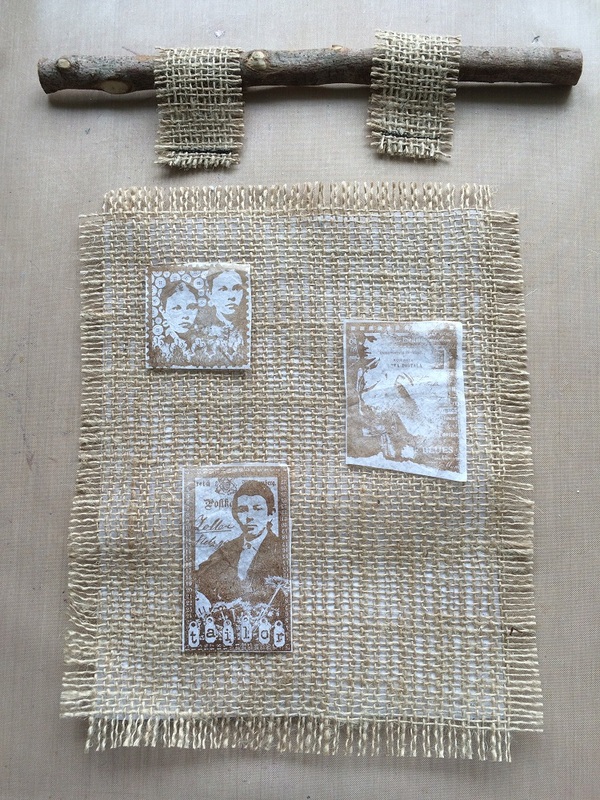 Step Four: I re stamped my chosen images on to soft tissue in Potting Soil Archival Ink. I chose soft tissue as opposed to tissue paper as I wanted it to melt into the hessian. Once I'd torn around the edges I applied them with Regular Gel matte medium. The colour of the ink changed slightly and bloomed a little (fortunately a happy accident) and I think it's because I used soft tissue and quite a lot of gel. Step Five: I stamped further images in potting soil onto unbleached cotton and stitched in place. I added buttons, lace and some embroidery and by this stage had stitched around the edge of the hessian onto a piece of cotton to prevent it fraying. I embroidered a small piece of text paper and attached with 3D foam over the grunge paste. Step Six: Even though the backing is unlikely to be seen I couldn't resist repeat stamping the diamond design in Tree Branch Archival Ink onto the cotton. To back the sampler I've used a product called 'phoomph' which is a stiff wadding that has adhesive on both sides, simply adhere the back and front to it. 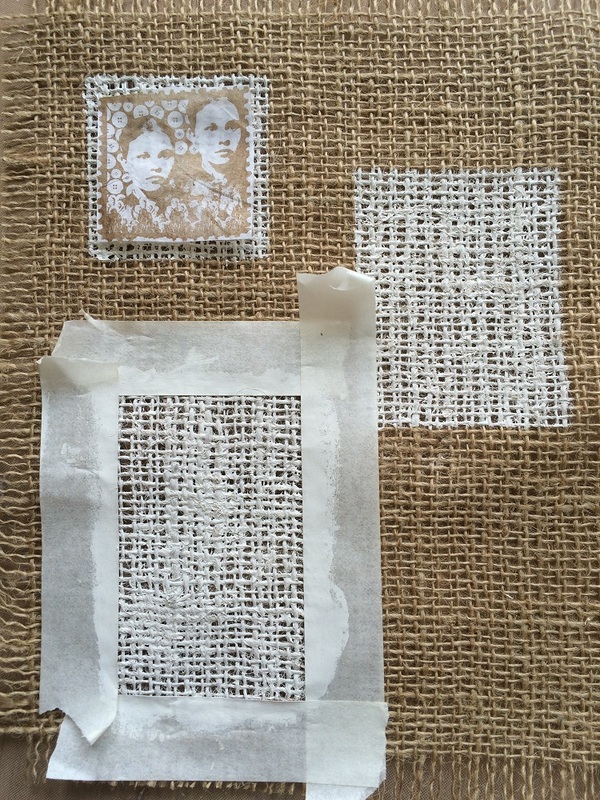 An alternative would be to use normal wadding or thick card and fabric adhesive. Step Seven: To finish, attach the tabs and thread through your chosen hanger. 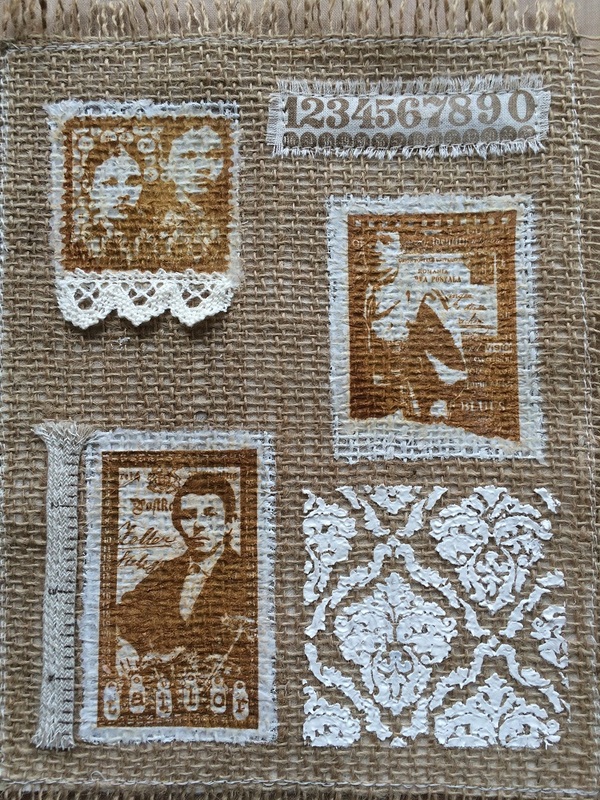 I chose this close up because I enjoyed embroidering the book text but you can also see how the weave of the hessian can be seen through the images and grunge paste. 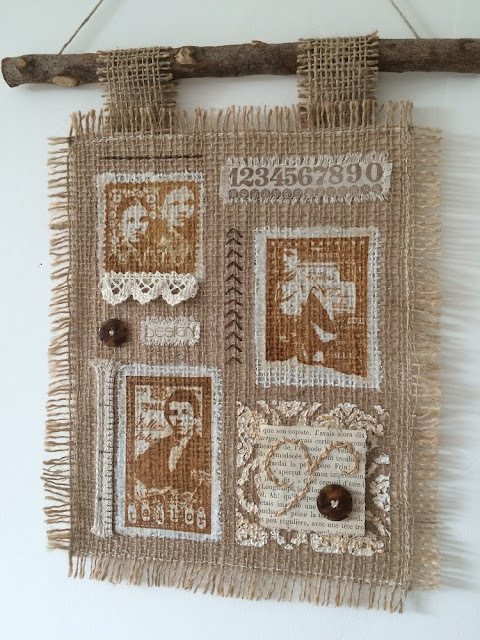 I loved doing this but there were a couple of challenges, firstly I think that the hessian I used was a very loose weave and quite uneven in places so it was difficult to embroider neatly but on the up side I loved the texture it gave. Secondly if I was doing it again, I would use tissue paper next time around as the soft tissue was a bit tricky to handle in keeping the images from stretching, but once I'd started with this method I had to continue and the up side to this was the 2 tone colours achieved. If you've never tried stamping on fabric before, I hope you might be inspired to join in with the challenge as the images can be so crisp on a fine cotton and just offer a different dimension. We would love to see how you interpret this topic by linking what you make to our 2016 Challenge #12: Fabric, on this page HERE. 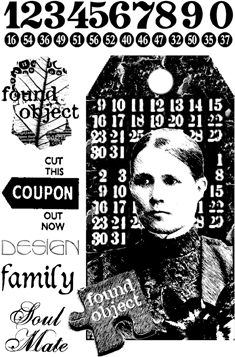 All links go in the draw to win a £50 voucher to spend on products of your choice from the PaperArtsy online store. The Fabric link will close 17:00 (London Time) Sunday, June 26th 2016. The winner will be announced 2 hours later at 19:00. I love this Ruth it's beautiful. AMAZING project, Ruth! Love the direction you chose. Perfect! Love the rustic and natural feel of the piece. 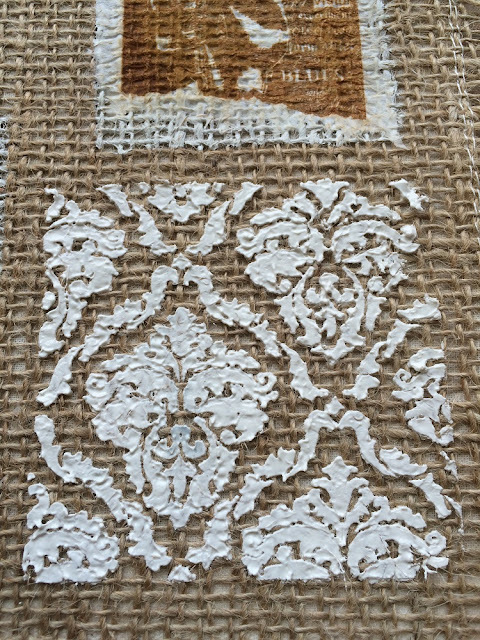 Very brave to tackle hessian, especially this loose weave one! What a fabulous 'earthy' looking hanging piece Ruth! Adore the colours and I think the stamped tissue is perfect. The images are as good as lots of mine on smooth paper, lol! I can relate to the loose woven hessian as the ones I have are the same. Love a bit of fraying but it can make it difficult to work with so I think. Beautifully balanced composition of images and stitchery. Simply lovely - the fabric adds a wonderful olde worlde texture and look to the images - beautiful work, Ruth! IT`s so woderful dear Ruth!! Love the stamped tissue so lovely attached in the painted frames, and your embroidery on old paper is beautiful as is the stenciled "frame" . What a gorgeous little hanger !! 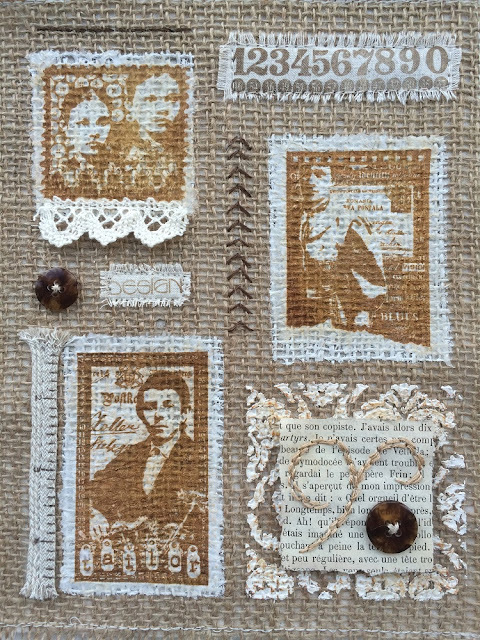 A stunning hanging Ruth x wonderful details and textures.....love it !!!! Very inspiring, really enjoyed reading all the step by step. Thanks for sharing your stunning creation. Yes I'm inspired Darcy, and I have often thought about making my own pencil wrap, but, unlike you, I wasn't brave enough or skilled enough to get to grips with the construction and sewing of it. So over and above the painting on the outside (beautifully layered), full marks for attempting this, and with a ZIP no less!